George Forrest hailed from Stewartstown, County Tyrone. 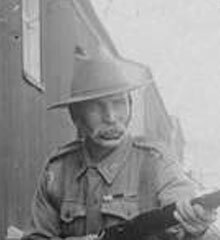 George enlisted on 19th January 1916 with the Australian Infantry. Forrest was a labourer prior to enlisting. He had been in the army for many years. He served as batman to Captain H W Matthews throughout the South African War. Private George Forrest was killed in action by a shell explosion at Messines, Belgium, shortly after commencement of the attack on 7 June 1917. He was about 60 years of age.